I recently read The Art of Game Design, by Jessie Schell, for which I should have a review up in the next few weeks. I picked up the book to try and better understand game development at the highest conceptual level: while it's still a developing idea. In the process, I became inspired to create a small game of my own. While driving home from work on a rainy day, I noticed a fairy ring growing while I was waiting at a traffic signal. The ring I saw was comprised of just a few mushrooms, but they can grow to be quite large. One section of Schell's book talks about the importance of using your subconscious mind to think of cool and crazy ideas. There are few things that let your subconscious mind wander like driving home in Houston traffic, and what's more crazy than a giant ring of mushrooms? I started to think, if the mushrooms in a fairy ring grow from a single point, what if the other mushrooms in the ring could start rings of their own? Would it just keep growing and growing in a fractal pattern? After reading that outline, you may have noticed something missing: goals and objectives. They're missing because I haven't figured out what they are. I honestly don't know what I could do with gameplay of this type that would be fun: a strategy game, where there's gameplay AI controlling "enemy" mushrooms? ; a puzzle game, where you have to cover the ground with spores, similar to Qix? ; an abstract game, where all you do is pop mushrooms and form random patterns in your "mushroom garden"? Since I'm not an experienced game designer, it's difficult for me to answer these questions before the gameplay has been implemented. 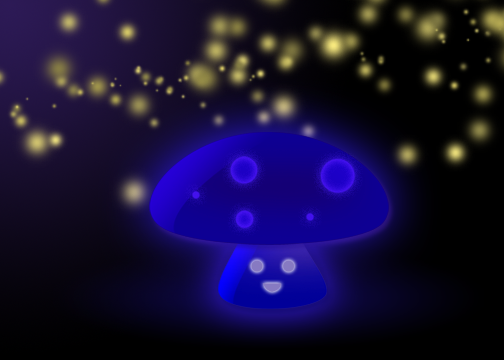 Some concept art I did in Photoshop for a glowing mushroom and fireflies. I'm not an artist, so don't be too hard on me. I think my favorite idea so far is to create a multiplayer game. Since mushrooms destroy everything inside their blast radius, I could potentially do something along the lines of Missile Command, where one player has to destroy the other player's mushrooms while growing their own mushrooms. Playing around with XNA networking services would be a lot of fun, and would be a great learning experience. 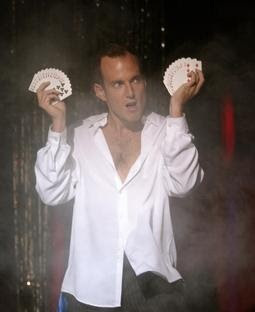 If I pursue that course of action, I will, of course, be sure to share my trials. 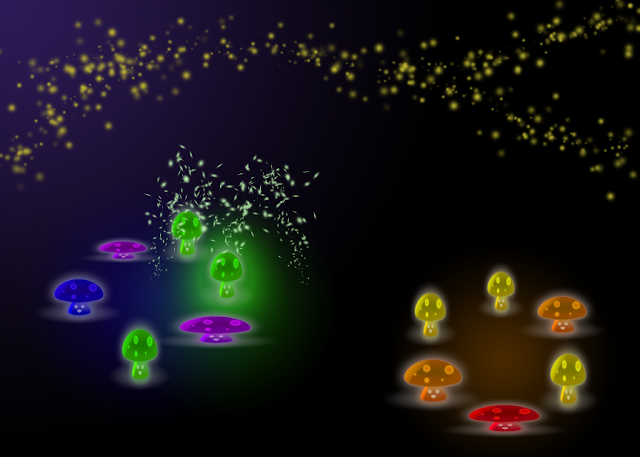 With networked multiplay, one player could have cool-colored mushrooms, while the other could have warm-colored mushrooms. In this image, the green mushroom on the left has been popped and is launching its spores. I was able to get very basic gameplay developed in one quick iteration. This is just a prototype, so the code was not test-driven. I've discovered that when thinking creatively, I can move quickly and get more things accomplished without writing tests. If I were to develop this fully, I would start with a clean slate and write my gameplay logic using TDD. One of the most challenging aspects of designing a game like this, which is essentially a one-button game, is accomplishing what Schell refers to as "balancing." I've experienced the feeling of an unbalanced game during development, but I was unable to articulate or appreciate the problem. I imagine mobile designers deal with this in an attempt to keep their games as casual as possible. Since the player cannot (or does not want to) control the customization of the game as in a traditional PC game, it becomes important for the elements of gameplay (such as my mushroom attributes) to "feel" correct and behave as expected. Sorry about the FRAPS watermark. I'm cheap. This is my first time developing with a touch interface. I have an iPhone, so I've been using the Windows Phone emulator that ships with Visual Studio. Because the performance of the emulator isn't optimal, I also have a Windows game project in tandem with the phone project. My friend and colleague, Jacob Beaudoin, has a Windows Phone, for which he recently began developing games. He will, undoubtedly, be doing some amazing stuff, so you should visit his website. While writing this code, I found myself questioning a lot of my design decisions when attempting to decouple gameplay components. For previous projects that I've worked on, this was never much of an issue. After speaking with Jacob, I believe the next book I'm going to read is Game Engine Architecture. The title sounds as inviting as a Junior High health textbook, but it's a topic I could definitely afford to learn more about. I'd also like to try reimplementing this game in UDK, to get some experience with UnrealScript and the Unreal Editor. All these objectives would dovetail together nicely. Writing this prototype was fun, and it was good to feel inspired and excited after the tedium that my day job has become lately. I will keep developing this only as long as it feels right. I appreciate other people's opinions, so if you think this is lame or awesome, be sure to give me some feedback.